Erodium cicutarium is an annual, winter annual or biennial that is a pioneer on disturbed and arid sites. It can cause yield reductions of crops and the seed is very difficult to clean out of small seeded crops. Erodium cicutarium is considered a noxious weed as it crowds out or outcompetes crops and native plant species. Erodium cicutarium provides forage for rodents, desert tortoise, big game animals, livestock and also upland game birds and songbirds. Prevention may be the best method for controlling Erodium cicutarium, however, it may be impossible to actually prevent this species from colonising, or to eradicate it, once present. There are few known chemical control methods for Erodium cicutarium besides, general herbicide controls. Erodium cicutarium is described as an annual, winter annual or biennial. It has a prostrate basal rosette and upright, often leafy flowering stalks. The stalks range from < 10cm to about 50cm high, and originate in the axils of the leaves. The leaves are divided into fine leaflets (or lobes) and are finely dissected, similar to those of a carrot. The flowers are about 1cm across, pink or lavender, and borne on stalks in clusters of 2-12. The sepals of the flowers are somewhat pointed and hairy. The fruiting structure (consisting of the seeds, persistent bristly styles, and central placental axis) is 2-5cm long and resembles a stork's bill. At maturity, the developing fruit splits into 5 segments, each with a long, spirally twisting style with a seed attached at the base. The style twists hygroscopically, drilling the seed into the soil (The Manitoba Agriculture, Food and Rural Initiatives, 2001; Hickman, 1993). Blackshaw et al. (2000) report that, \"In Canada, Erodium cicutarium has been present as a weed in farmyards and along roadsides for many years. Recent weed surveys indicate that it is increasing in occurrence and abundance on cropland ( Anonymous, 1992; Thomas et al., 1995).\" Blackshaw and Harker (1998) state that, \"E. cicutarium may be expected to be less prevalent and competitive with crops in very arid environments.\"
Griffith (1998) states that, \"Erodium cicutarium germinates early spring through late summer and flowers in early spring or early summer.\" Fedorenko et al. (1996) report that in Argentina, \"E. cicutarium can hasten their reproductive phase at the end of the growing season, a time when maximum air temperatures are high (35 °C) and soil water availability is reduced (e.g. precipitation during October and November was only 17% of that in July and September. This could be an important strategy in these species, allowing them to persist as seeds, and produce a new generation under favourable environmental conditions.\"
Howard (1992) reports that, \"Erodium cicutarium provides seasonal forage for rodents, desert tortoise, big game animals, and livestock. The seeds are eaten by upland game birds, songbirds, and rodents.\" Howard (1992) states that, \"The presence or absence of E. cicutarium pollen in fossil records, sediment lakebeds, and artifacts has been used as a dating technique in paleobotany and archeology.\"
Howard (1992) reports that, E. cicutarium besides being a pioneer on disturbed sites, is also a residual or secondary colonizer. Seedlings can either establish from on-site seed or from seed carried in by animals. In annual grassland communities, E. cicutarium a persistent ruderal can be intolerant of the mulch layer that builds up in some areas. E. cicutarium will tolerate partial shade, but vigor is reduced. Griffith (1998) adds that, \"E. cicutarium prefers dry, sandy soil, and is found in many perennial horticultural crops, turfgrass, and landscapes.\" It also grows readily on soils of less sandy texture. It occurs in great abundance throughout arid parts of California, including the Mojave Desert. According to Mensing and Byrne (1998), E. cicutarium was among the first invasive Eurasian plants to become naturalized in California. Blackshaw et al., (2000) report that in Canada, \"Weed surveys indicate that E. cicutarium has recently increased in distribution and abundance on cropland, especially in areas where conservation tillage has been adopted (Anonymous 1992 ; Thomas et al., 1995, in Blackshaw et al., 2000 ).\"
Howard (1992) states that, \"Erodium cicutarium reproduces sexually. Seasonal rains and soil temperatures trigger germination. Light rains result in lower germination rates than heavier rains. Plants are sexually mature 2 to 4 months following germination. Seed either falls beneath the parent plant or is disseminated by animals. Rodents frequently bury E. cicutarium seed in a food cache where unconsumed seed later germinates. Seed also catches on animal fur and is disseminated in that manner. Seeds of E. cicutarium can remain viable for many years, and form extensive seed banks.\" Blackshaw and Harker (1998) state that, \"E. cicutarium germinates readily at soil temperatures of 5-20 °C ( Blackshaw, 1992) and optimum growth occurs at 15-25 °C ( Blackshaw & Entz, 1995).\"
Blackshaw and Harker (1998) state that, \"Increased competitive ability of Erodium cicutarium appeared to be related to increased rainfall during the growing season. Weed surveys in western Canada indicate that E. cicutarium occurs more frequently on irrigated cropland and in areas receiving greater than 500mm precipitation annually ( Anonymous, 1992, in Blackshaw and Harker 1998). Palaez et al. (1995, in Blackshaw and Harker 1998)) found that E. cicutarium exhibited more vigorous and productive growth under wet than dry conditions but that it could persist under drought stress.\" In one arid California grassland, Erodium cicutarium cover averaged 30-85% in growing seasons when precipitation totaled only 13.1-17.7cm (Kimball and Schiffman 2003). Recommended citation: Global Invasive Species Database (2019) Species profile: Erodium cicutarium. Downloaded from http://www.iucngisd.org/gisd/species.php?sc=518 on 21-04-2019. E. cicutarium has the potential to become a serious competitor of early planted spring crops on the Canadian prairies, it has been recognised as a problem weed capable of causing economic losses in pasture and forage crops (such as Medicago sativa), and in arid wildlands. This is facilitated by its ability to emerge and thrive under cool to moderate temperatures (Blackshaw and Harker, 1998). Kimball and Schiffman (2003) discuss the characteristics of E. cicutarium that make it such a problem weed: \"E. cicutarium germinates and flowers early and continues to flower throughout the growing season, giving it a longer inductive time period than many later-maturing annual species; \" E. cicutarium is a fierce competitor, producing many seeds that germinate early, developing a deep tap root quickly, depleting soil water, and preventing sunlight from reaching seedlings of other species that germinate later and it may prevent establishment of perennial grasses by blocking access to light. Brooks et al. (2003) report that increased density and biomass of E. cicutarium created in response to increased soil nitrogen may heighten competition for soil moisture, potentially decreasing density, biomass and diversity of native annual plants. An integrated approach to the management of Erodium cicutarium is important, especially since herbicides for in-crop control of E. cicutarium are limited and control is often unsatisfactory. For details on management options, please see management information. Informations on Erodium cicutarium has been recorded for the following locations. Click on the name for additional informations. Summary: Scientificpaper regarding impacts and management of species as well as distribution information in Canada. Blackshaw, R., G. P. Semach, and J. T. O Donovan. 2000. Utilization of Wheat Seed Rate to Manage Redstem Filaree (Erodium cicutarium)in a Zero-Tillage Cropping System 1. Weed Technology 14:389-396. Summary: Scientific paper regarding impacts and management of species as well as distribution information in Canada. Crop Protection Section. 1984. Stork s Bill (Erodium cicutarium). Plant Industry Branch Saskatchewan Agriculture. Griffith. 1998. Erodium cicutarium (Redstem filaree): Biology. Oregon State University Agronomic Weed Science Program: Weed Programs in Oregon. Haar, M. J., S. A. Fennimore, H. A. Ajwa, and C. Q. Winterbottom. 2003. Chloropicrin effect on weed seed viability. Crop Protection 22: 109 -115. Summary: A detailed report on resistance of species to various new and old herbicides. Hoffmann, A. J. 1978. Flora Silvestre de Chile Zona Central (4 ed. 1998) El Mercurio , Santa Maria 5542, Santiago, Chile. Howard, J. L. 1992. Erodium cicutarium. Fire Effects Information System, [Online]. U.S. Department of Agriculture, Forest Service, Rocky Mountain Research Station, Fire Sciences Laboratory. Kimball, S., and P. M. Schiffman. 2003. Differing Effects of Cattle Grazing on Native and Alien Plants. Conservation Biology 17(6): 1681-1693. Summary: A detailed report on the effects of grazing on species, along with background information and distribution. Manitoba Agriculture, Food and Rural Initiatives. 2001. Pest Management - Weeds - Stork s Bill. Weeds, Insects, & Diseases: Biology, Scouting Techniques, Effects on Crop Quality, Threshold/Yield Loss and Control Tips. Meyer, M. D. and P. M. Schiffman. 1999. Fire season and mulch reduction in a California grassland: a comparison of restoration strategies.Madrono 46: 25-37. Summary: Book describing many important North American weed species. Trainor, M., and A. J., Bussan. 2001. Redstem Filaree (Stork s Bill): Erodium cicutarium. Montana State Weed Science: Montana State University Extension and Department of Land Resources and Environmental Sciences. Brooks, M. 2003a. Effects of increased soil nitrogen on the dominance of alien annual plants in the Mojave Desert. Journal of Applied Ecology 40: 344-353. Summary: Scientific paper regarding the impacts, nutrient requirements, and life history of species. Fedorenko, D. E., O. A. Fernandez, C. A. Busso, and O. E. Elia. 1996. Phenology of Medicago minima and Erodium cicutarium in semi-arid Argentina. Journal of Arid Environments 33: 409-416. Summary: Scientific Paper that offers some background information on species and distribution information. Hickman, J. C. (ed.) 1993. The Jepson Manual: Higher Plants of California. University of California Press. Mayor M. D., R. M. BoHo, D. V. PelaHez, and O. R. Elia. 1999. Seasonal variation of the seed bank of Medicago minimaand Erodium cicutarium as related to grazing history and presence of shrubs in central Argentina. Journal of Arid Environments 43: 205-212. Mensing, S. and R. Byrne. 1998. Pre-mission invasion of Erodium cicutarium in California. Journal of biogeography 25: 757-762. Summary: A historical report that documents the introduction and spread of species throughout North America. Pakeman, R. J., J. P. Attwood, and J. Engelen. 1998. Sources of plants colonizing experimentally disturbed patches in an acidic grassland, in eastern England. Journal of Ecology 86: 1032-1041. Summary: A scientific paper that documents the species spread in England, offers management information, and some distributions. USDA-GRIN (Germplasm Resources Information Network). 2003. Erodium cicutarium. National Genetic Resources Program [Online Database] National Germplasm Resources Laboratory, Beltsville, Maryland. USDA-NRCS (Natural Resource Conservation Service). 2005. 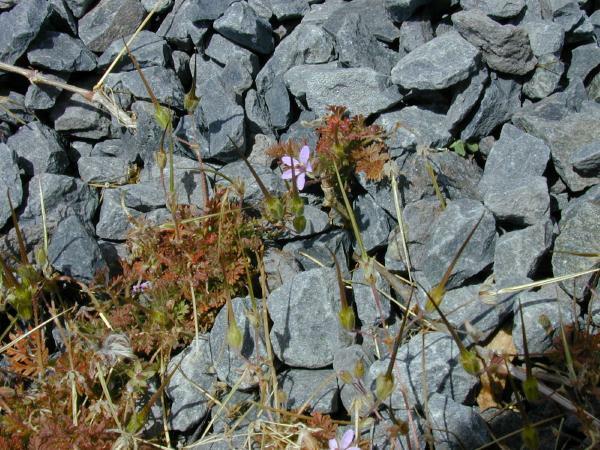 Erodium cicutarium. The PLANTS Database Version 3.5 [Online Database] National Plant Data Center, Baton Rouge, LA. Summary: Available from: http://plants.usda.gov/java/profile?symbol=ERCI6 [Accessed 6 March 2006].